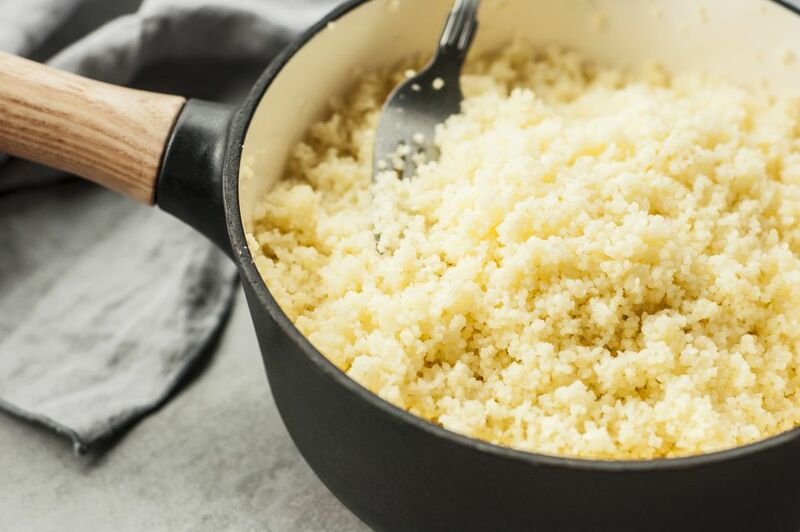 The word couscous is derived from Arabic, but the dish is typically considered part of North African cuisine which includes Libya, Morocco, Tunisia, and Algeria. Still, it also plays a large role in Middle Eastern dishes. But what is couscous exactly? Is it a grain? Is it pasta? The short answer is that it is pasta. Basically, it is little balls of semolina. Or, in the case of Israeli couscous, slightly bigger balls of semolina. But, it's not to be confused with pastina, the smallest type of pasta made with wheat flour that is typically used in soups. Making couscous by hand, as has been done since ancient times, is seriously labor intensive. But the versions sold in Western stores are machine made, pre-steamed and dried to allow for very quick cooking. In fact, 5 minutes is about all it takes for the tiny grains to steam once your liquid has come to a boil. The liquid can be water but using chicken or vegetable broth is the most common flavor enhancement. Add salt and stir. Add couscous and remove from heat and allow to sit for about 5 minutes. Couscous should be light and fluffy, not gummy. Be sure to allow the couscous to absorb the water and then fluff with a fork. Serve as the base for a stew or as a side dish. Most grocery stores choose to stock the couscous with the grains and rice instead of the pasta section so that is where you'll most likely find it. In North African cuisine, cooked couscous is usually the base for a stew with plenty of vegetables and some lamb or even chicken. But it also can be made into a dessert, common in Egyptian cooking, with cream, sugar, cinnamon, and raisins. It also makes a great side dish mixed with plenty of fresh parsley and some toasted pistachios for a satisfying crunch.